A number of methods exist to fragment the specimen within the LapSac. After completion, we examine the tissue fragments and attempt to separate gross tumor from normal renal parenchyma and perinephric fat. Finally, we inspect the bag for unsuspected perforation. We routinely perform manual morcellation using a ringed forceps, where there are no sharp edges or teeth within the jaws. It is introduced through the externalized LapSac mouth and repeatedly applied to the specimen, yielding small fragments. Others have utilized Kelly clamps, Krause forceps, or placental clamps. We prefer avoiding instruments with narrow or pointed tips, which may inadvertently damage or perforate the bag. During manual morcellation, we maintain upward traction on the LapSac to fix the specimen close to the abdominal wall as well as to minimize folds of the material, which may be caught within the morcellating instrument. In addition, we prevent fluid produced during the process from spilling outside the bag. Manual morcellation can be tedious and time consuming. In an early series, the reported median time required for kidney entrapment and morcellation was 42 and 53 minutes, respectively (8). Thus, alternative methods and equipment have been tested. Initially, a high-speed electrical laparoscopic morcellator was commonly used, but is currently unavailable. The device consisted of a recessed blade that cut tissue directly in contact with the tip, and fragments were evacuated via suction attached to the handle. Other similar instruments have been adapted. The Steiner morcellator was described in 1993 for the rapid laparoscopic removal of tissues from the abdomen (13). The cylindrical instrument consists of (i) a coring knife at the end that is (ii) rotated by an electrical microengine. Tissue is brought into contact with the exposed cutting tip using a grapser through the center of the instrument. The electrical prostate morcellator (VersaCut™f) has been applied to renal specimens. The instrument is designed for intravesical morcellation of prostatic tissue after laser enucleation, with an exposed side-cutting blade. Without a fluid-filled environment, the shaft rapidly overheats and ceases to function. Landman et al. compared the high-speed electrical laparoscopic to the Steiner and prostate morcellators on porcine kidneys in an ex vivo model, using both the LapSac and EndoCatch and various media (i.e., fluid, no fluid, CO2) (23). The Steiner morcellator was most rapid and yielded the largest mean fragment size (2.97 g). The single case of bag perforation occurred with the high-speed electrical laparoscopic in the neck of the LapSac, and was thought to be due to thermal damage. Integrity of the EndoCatch was apparently maintained with both the Steiner and prostate morcellators, as assessed by permeability to dilute indigo carmine. 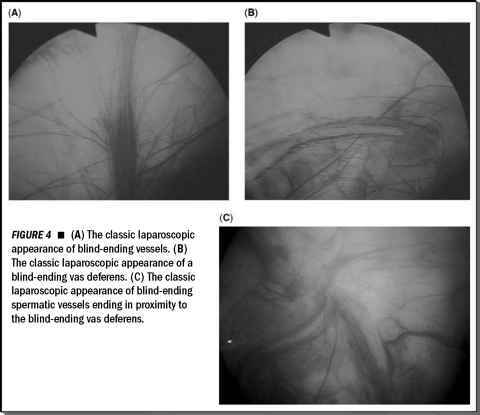 Although the environment did not affect performance of the high-speed electrical laparoscopic, Parekh et al. suggested that the safety of the Steiner device was increased by morcellation within a fluid-filled LapSac (24). More recently, Cai et al. morcellated porcine kidneys using the prostate morcellator (25). Introduction and internal visualization using a nephroscope increased morcella-tion time (86.9 minutes) but reduced LapSac perforation (10%) compared with direct insertion of the device and external (laparoscopic) visualization (47.1 minutes and 0.015 g fragments). Manual morcellation with a ring forceps was most rapid (15.1 minutes), resulted in larger fragments (1.36 g), and did not damage the bag. Thus, manual morcellation was superior to the electrical prostate morcellator in all aspects. Interest has developed in the use of water jet technology to aid laparoscopic operations, primarily partial nephrectomy. The device uses high-pressure fluid flow to cut the parenchyma of organs, with preservation of vascular structures. Due to limitations of all electrical morcellators, Varkarakis et al. designed a device to apply a high-pressure (1200-1500 psi) saline stream for specimen ablation and removal (26). In a porcine model, advantages of water jet over manual morcellation included shorter time (5.65 minutes vs. 11.91 minutes) and reduced time per gram of tissue removed (1.42sec/g vs. 2.98sec/g). Renal parenchyma and fat were easily fragmented, and collagenous tissue was subsequently removed manually. However, evidence of microscopic perforation of the LapSac was present in 80% of the water jet group. In addition, pathologic evaluation, including cytology, was impossible with the foamy product of water jet morcellation. None of the currently available devices to facilitate morcellation is ideal and all should be used cautiously in clinical situations. Even with the use of the LapSac and fLumenis, Santa Clara, CA. direct observation of morcellation, small perforations occur frequently; the neck of the bags can also be damaged from the heat produced from rapidly rotating shafts. Thus, we continue to manually morcellate specimens when indicated. Landman et al. describe a modified method of manual morcellation using the EndoCatch sack, preferred because of the deployment ring (27). Through a 3 cm incision, manual morcella-tion was performed with direct observation of the specimen, and only visible portions of the kidney were grasped. There was no case of bag perforation and mean morcellation time in 12 patients was 11 minutes. This technique appears safe and rapid, and we also increase the incision length to allow "finger fragmentation" and removal of larger pieces. However, the benefit of easier specimen entrapment must be weighed against weaker bag material. Morcellation avoids the need for a larger incision and may maximize the minimally invasive approach. Improved cosmesis is a clear advantage of specimen fragmentation and piecemeal removal. Another potential benefit is the reduction of incisional hernias. Elashry et al. observed postoperative hernias in 17% of patients after intact kidney removal (28). Examination of the literature on laparoscopic donor nephrectomy and hand-assisted nephrectomy reveals that the incidence ranges from 0.6% to 5%, while port site hernia is nearly absent if one uses nonbladed trocars (29-31). However, theoretical limitations are associated with the process and other morbidity benefits remain to be proven.